Customer journey mapping is the documentation of the customer as they move through your sales cycle. Journey maps help organizations target their collateral toward customers based on their thoughts and motivations with your brand. 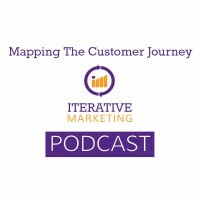 Mapping the customer journey is the third actionable component of Iterative Marketing. While personas capture your target audience in a specific moment in time, customer journey mapping animates your persona as they move through the process of interacting with your brand.